Indians Baseball Cards: #PackADailyCircus - Pack 230 - The Balking Dead Rise from the Dead! #PackADailyCircus - Pack 230 - The Balking Dead Rise from the Dead! Welp, I finally got the recent draft done. Turned out to be only ONE draft instead of the two I had hoped. But, things will work out before all is said and done, so no worries there. In the meantime, The Balking Dead *FINALLY* manage to grab a free agent. Oh, no, I'm sorry, they grabbed THREE free agents this time! I, on the other hand, was shut out - as were several others. Dang it. Congrats, managers! The full list has been updated. So, now I can whip out another draft. 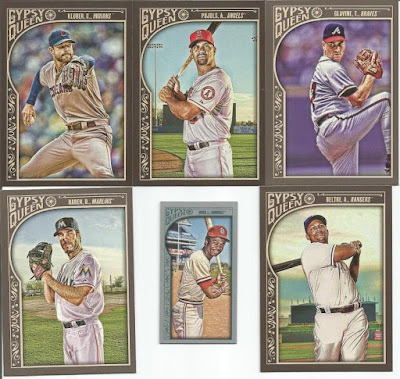 Quick program note: I mentioned some time ago that I bought *TWO* Hobby boxes of Allen and Ginter that were going to be used for Gint-A-Cuffs. I opened the other box and quickly went through the cards and believe it would have done worse than my first box, so I did not submit/post that one. Instead, I will post the entire Hobby Box as a regular break here and let the cards fall as they may. Wahoo!! We've knocked yet another Perfect Pack! And, we managed to get two managers to get 2 hits! Heck, we nearly had a mirror image thing going there. Congrats, everyone!